Looking to add some filling protein to your meals or snacks this summer? One great way to do so is by incorporating Greek yogurt. Not only is it filling, Greek yogurt is also a great way to add some creaminess to your food without the excess calories and saturated fat. Along with some nutritional highlights of this silky-smooth food, we’ve compiled a quick list of great ways to add Greek yogurt to your daily routine. Greek yogurt is a wonderful addition to a meal or snack due to its high protein content, versatility, portability, and other health benefits. One cup of plain Greek yogurt typically contains 23g of protein for around 130 – 170 calories, depending on the fat content (the percent fat to get depends on your individual nutritional needs). Also, because it is thicker than traditional yogurt, many people find the texture alone makes it seem much more filling. Like other yogurts, Greek yogurt comes in a variety of flavors. While tasty, flavored typically means packed with added sugar. The healthiest option is to buy plain (sometimes called “original”), then add your own flavor using honey or fresh or frozen fruit. For savory dishes, you can even add herbs, spices, and sauces to amp up the taste. 1. Swirl it into your morning oats. If you combine ½ cup oats, ⅔ cup water, ½ cup blueberries, ¼ cup plain Greek yogurt, a touch of maple syrup, and cinnamon, then microwave for 2 – 2 ½ minutes, it tastes like a blueberry cream cheese muffin! 2. Spread it on whole wheat bread. More of a toast fan for breakfast? Replace the butter with plain Greek yogurt and add fresh fruit on top. 4. Layer it. For breakfast, a snack, or dessert, make a parfait by alternating layers of plain Greek yogurt, fresh or frozen berries, and whole grain cereal or toasted oats. 5. Shake it up. Make your own salad dressing to up the protein content of lunch or dinner. Try it in a Simple Vinaigrette, in a Creamy Avocado Dressing, or in a healthier version of Ranch Dressing. 6. Replace your sour cream, mayo, or cream cheese with plain non-fat Greek yogurt. This works not only as a topping, but also in any casserole, sauce, or baking that calls for any of those three. 7. Mash it. Add non-fat Greek yogurt to mashed potatoes to give them a silky-smooth texture. This is a great time to also play around with adding herbs and spices to the yogurt. 8. Make baked goods healthier by replacing some of the butter or oil with plain non-fat Greek yogurt. The exchanges: Sub 1 cup of butter with 1/2 cup butter + 1/4 cup Greek yogurt. Sub 1 cup oil with 3/4 cup Greek yogurt. 9. Freeze it. For a cool treat during the summer, freeze Greek yogurt for a couple hours. Chobani now has Greek yogurt tubes that work great for this! 10. Top it with warm fruit. Have a grill? Grill up some fresh pineapple, peaches, pears, apples, or berries and place them over Greek yogurt for an after dinner treat. For even more healthy recipes, be sure to check out Chobani’s Pinterest boards! 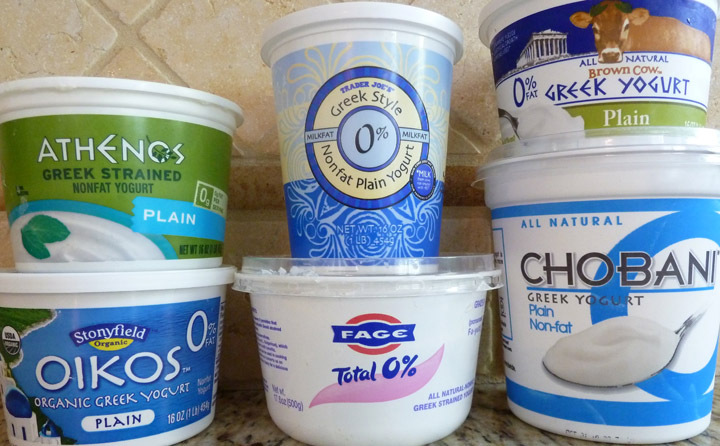 Which Greek yogurt brand should you buy? That’s all up to personal preference (and most people have strong preferences). Each brand differs slightly in thickness and flavor, so if you’re not sold on one brand give another a shot! Have a favorite way to incorporate Greek yogurt into your meals or snacks? Share with us by leaving a comment! Happy Eating!